Winners of the Wolfson Economics Prize 2014: Garden Cities - We have the answer! At an awards ceremony at the RIBA last night URBED were announced as winners of the 2014 Wolfson Economics Prize - the second most valuable economic prize after the Nobel Prize. Our submission, developed with Jon Rowland and Pete Redman, illustrated how we could double the size of the historic, if fictional, city of Uxcester, and then applied the ideas to the very real issues being faced in Oxford. Our Garden City is one grown from the strong rootstock of an existing place rather than a freestanding new town. We identify 40 towns and cities where the model could be applied and are already in discussion with a number of places interested in applying the ideas. Our full essay was published last week and is available here. The article below outlines the economic case that we make in the essay for improving the quality of housebuilding while the article from Nicholas Falk describes the implications for Oxford. We look forward now to taking these ideas forward, through research and discussions with policy-makers but also through our hands on work as planners and designers. The country that gave the world the Garden City is now building around 100,000 fewer homes each year than it needs to. What is more, the quality of the housing that is built, while better than it used to be, is still poor compared to other Northern European countries, in terms of space standards, environmental performance, layout and infrastructure. 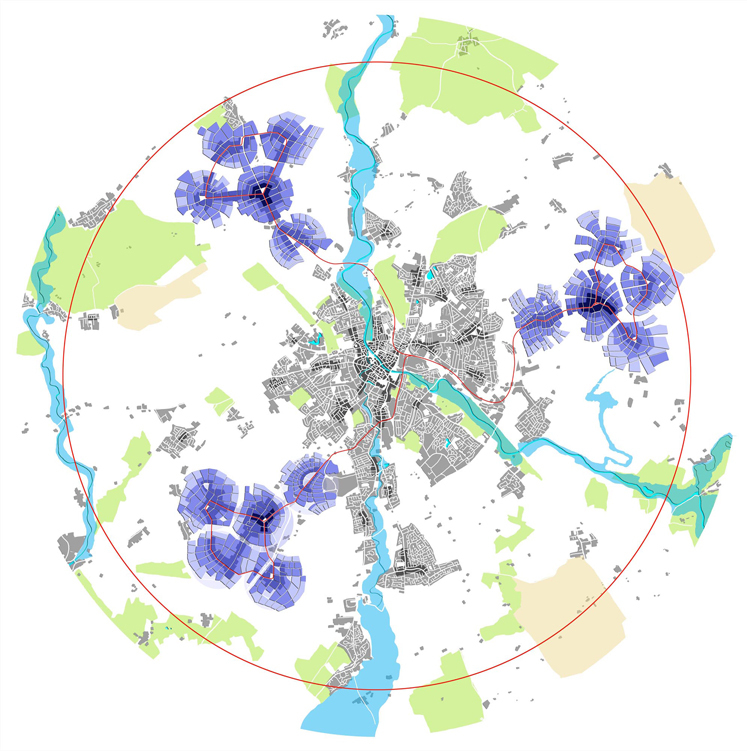 For many years URBEDâ€™s Nicholas Falk has led study tours to cities like Freiburg, a German city near Basel of a little over 200,000 people that has built two large urban extensions at Vauban and Rieselfeld in the last twenty years. Walking through these new neighbourhoods with UK politicians, professionals and community activists, past the shining trams, high-quality housing and generous green space, the question asked is always; why canâ€™t we do this?â€™ The answer is not that we in the UK lack the talent or commitment, but rather that our system makes it if not impossible then at least very difficult. So in our submission for the 2014 Wolfson Economics Prize we showed how this system might be reformed. The economics of the original Garden City, was based on what its creator Ebenezer Howard called the â€˜unearned incrementâ€™ â€“ the uplift in the value of land that happens when development takes place. Howard was writing before the planning system was created and today the â€˜unearned incrementâ€™ is created by the mere allocation of land for development. An average piece of farmland in the UK is worth around Â£15,000 per hectare. If it is granted consent for housing then its value rises to more than Â£2M per hectare. That value uplift goes to the farmer and to all the agents, housebuilders, lawyers and consultants who prised the consent out of the local planning authority. In Freiburg and indeed much of Northern Europe, the money and effort is spent not on the land but on the neighbourhood, it builds the trams, creates the parks and schools and is spent on the quality of the housing. In our Wolfson submission we propose a set of reforms to allow the same economics to be applied to the development of a new round of Garden Cities in the UK. Land would be acquired with fair compensation for owners but otherwise at existing use value. This will require legislation; a new Garden City Act that creates the powers to allow towns and cities and their partners to acquire land and plan positively in the way that their peers are able to do elsewhere in Europe. Rather than plan Garden Cities from Whitehall, we propose to invite cities to bid for Garden City status and the powers that go with it. Our discussions in cities like Oxford, where house prices are now eleven times average incomes, suggest that Garden City designation could be a solution to the problems of accommodating growth that many of these cities currently face. We based our calculations on the purchase of 6000 hectares of land, half of which would be allocated for open space with the balance being used to build just under 70,000 new homes, employment space for 70,000 jobs along with shops, schools and other facilities. Once developed the land would be worth just over Â£6B. Factoring in acquisition, financing and other costs, the â€˜unearned incrementâ€™ is just over Â£4B. What can you get for that nowadays? Well, you can build the schools and the health facilities you will need, construct quite a lot of roads, build a tram system and lay out all the open space. In short you can do what Freiburg has done. But can you build a Garden City? Well that depends what you mean by a Garden City and particularly what you mean by a â€˜cityâ€™. The assumption has tended to be that Garden Cities are freestanding new towns of up to 30,000 homes. This of course is not a city, indeed even Ebenezer Howard recognised that to be sustainable his Garden Cities needed to be part of a wider network that he called the â€˜Social Cityâ€™. This is important because in the modern world, cities are the centre of our economy. Places that cannot offer the attractions of city life struggle to attract graduates and employers. To build a Garden City we therefore need to extend our shopping list; we are going to need a city centre; a proper one with shops, bars, theatres and galleries. We need a mainline railway station (and of course a mainline railway to serve it), a large hospital, a university or two (preferably Russell Group) and a cathedral would be nice. The Â£4B is not going to be enough, not by a long way. Even if it were, most of this stuff cannot be bought off-the-shelf, it needs to be cultivated for a few centuries. We therefore concluded that rather than grow a Garden City from a seedling that will be vulnerable for years we should graft it onto the rootstock of an existing city. We targeted historic cities with populations of 1-200,000 and explored the implications of doubling their size through a series of urban extensions. To do this we invented the city of Uxcester (pronounced uss-ter), to avoid becoming mired in the complexities of a particular place. Uxcester was modelled on York, leavened with a little bit of Chester and seasoned with Glocester and Worcester. It is a city of 200,000 people in 85,000 homes currently growing at 1% a year. Our plan is to double the size of the city in 35 years by building three substantial urban extensions within 10km (or a 20 minute tram ride) of the centre. Uxcester may be fictional but the pressures that it faces are very real to many UK cities of this size. Cambridge is already planning expansion on this scale and as part of our submission we explored the implications for Oxfordshire, where 100,000 new homes are needed to cope with demand. Our Garden City is therefore grown from an existing city and the new housing is built within reach of all its existing facilities. Doubling the size of the city will take up only 15% of the land within this 10km ring, much of which will be farm land with little ecological value and no public access. Our Garden City needs to rediscover the spirit that built Edinburgh New Town or Bath or, for that matter Londonâ€™s Bloomsbury. None of these were built on brownfield land, they were built confidently on the fields that surrounded the city and in doing so enhanced its beauty and setting. These fields of course are today in the green belt and are the most closely guarded of all our green fields. However if we are serious about building more homes and enabling our cities to compete with those in Northern Europe, we need to have the confidence to reallocate some of this sacred land. In doing so we should use the Garden City to expand and enhance the city rather than building an alternative to it in places that no one can object to, because no one wants to live there! URBEDâ€™s Wolfson submission is written by David Rudlin with Nicholas Falk, Jon Rowland (JRUD) and Pete Redman (Traderisks). It also benefitted from contributions from Joe Ravetz (Manchester University), Jeff Austin (JVM) and Gerard Dericks (University of Oxford). The draft also benefitted from the expert advice of our sounding board who are listed on the inside cover of the submission. A 21st Century Garden City for Oxford? The idea of a new crop of Garden Cities is receiving a lot of attention nationally, thanks in part to the 2014 Wolfson Economics Prize and the efforts of organisations like the Town and Country Planning Association and Shelter. Ebenezer Howardâ€™s original idea, which he started to apply in Letchworth and Welwyn Garden Cities, was to use the â€˜unearned incrementâ€™ from the uplift in land values as a result of development to fund high-quality infrastructure, including electric tramways to connect new communities into what he called â€˜the Social Cityâ€™. In the past it was seen as a means of enabling city dwellers to escape from cramped and polluted conditions to places that combined the best of town and country. However in a city like Oxford, with its congested roads, rising energy costs, and potential for economic growth, a â€˜Garden City for the 21st centuryâ€™ offers the chance of attracting investment to make the city as a whole much more sustainable, as well as widening housing choice. Over the last year, Jon Rowland and I have been supporting the Oxford Civic Society and others in looking at the bigger picture, and over a longer time-span, in the light of experience elsewhere. The results, were published as Oxford Futures: Achieving smarter growth in Central Oxfordshire. At the launch Oxfordâ€™s new Professor of Geography and housing expert Danny Dorling warned that if Oxford does not grow, it will find its position as a leading university will be lost to others. Our research showed that it was practically impossible to build a new Garden City from scratch; it needed to be grafted on to â€˜strong root stockâ€™, because the costs of infrastructure are greater than the value released by building the new homes. Having been shortlisted for the 2014 Wolfson Economics Essay Prize for a new Garden City in the fictitious town of Uxcester, we decided to testing out our ideas in Oxfordshire as part of the second stage. We wanted to see if it were possible to achieve an ambitious and long-term aim of doubling the population of Central Oxfordshire without any loss to the quality of life that residents already prize. In particular, could Oxford grow in a similar way to its twin city of Grenoble, Franceâ€™s â€˜high tech capitalâ€™, or to Freiburg in Germany, near Basel, whose Director of Development spoke at one of our events in Oxford Town Hall? Land for development within the City boundaries is inevitably very limited. But on the borders in places like Kidlington, there are opportunities to â€˜piggybackâ€™ on the investment going into the new Oxford Parkway station at Water Eaton, and the new road links that the government is funding. Of course it is vital to avoid flood plains or pressures on overloaded junctions. Pete Redman who advised us on finance demonstrated that there would be enough funding available to fund a new tram system and to create a series of country parks so that people could cycle or use public transport as they do in comparable cities on the Continent. This would up a relatively small part of the green belt, and could be part of a â€˜dealâ€™ that preserved the many villages that are now under pressure from developers within Oxfordshire. So what are the obstacles? There will always be resistance to development and fear of a leap into unknown territory. Over the last few decades confidence in planning and development has declined to an all-time low. However a 21st Century Garden City for Oxford could offer a range of benefits to the existing community, as a meeting that we organised as part of our Wolfson work at Cutteslowe Community Centre demonstrated. The key is ensuring that there is an organisation in place to provide the necessary leadership and to ensure that the promised benefits are delivered, through a Garden City Land Company, serving a Trust that brings the stakeholders together. With the promise of planning permission, a Bond would be issued to raise private finance to open up sites to a wide range of house builders, including many who want to commission their own homes but cannot find a plot. The Leader of the County Council has already gone on record saying that doing nothing is not an option, that 100,000 new homes need to be built somewhere, and that a Continental style transport system is needed to stop Oxford grinding to a halt. The Uxcester proposals are a modest first step in showing how the ambition could be realised, and perhaps the Wolfson Prize provides some neutral ground for people with very different concerns to come together to ensure that Oxford remains in the forefront of European cities, and not a museum piece for the Chinese to look at on their way to shop at Bicester Village! The URBED team would like to congratulate David, Nick and the team for this amazing result and thank them for all their hard work! We are looking forward to putting these ideas in practice over the coming months. Please visit our Wolfson Prize project blog for more information. Copyright Â© 2014 URBED, All rights reserved.